I am having so much fun blogging...and the best part is connecting with my amazing readers! The idea here is for me to thank who gave me the award, tell you guys a bit about myself, and pass on this award! There are so many blogs that I love...and I wish I could award all of you...and some of you I have already awarded here (and you ya'll know who you are and that I *heart* you!). So, here it goes! #1: Thank you so much to Joann at Lucky Duck Loves for giving me this award!!! XOXO to you Joann!!! #2: Copy Award: Done, see above! :) Too cute! And...I love cupcakes. Perfect! #3: 3 things that I like to do: Read, Write, and Shop! Hence...the general theme of my blog! 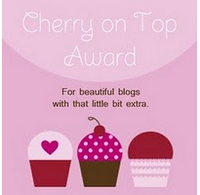 #4: Send this Award to 5 Blogs: These are all AMAZING blogs!!! I read these beautiful girl's blogs every day; so, please head on over and check out their awesome blogs! Sending lots of love to all you ladies with this award!!! Thanks for reading! And, thanks again to Joann who made me smile with this lovely award! Thanks so much Pammy. So glad you enjoy reading my blog. Congrats on your award. @FunnyFaceBeauty-My pleasure Alicia! Love your blog!!! XOXO!! !